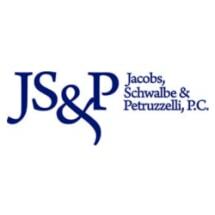 Jacobs, Schwalbe & Petruzzelli, P.C., in Cherry Hill, New Jersey, is a well-established full-service law firm providing experienced counsel in workers' compensation, Social Security Disability, personal injury and employment law for the past 38 years. The firm’s reputation and law practice are built upon integrity, compassion and unsurpassed attorney expertise. Mark S. Jacobs, the senior and founding partner, has dedicated his entire legal career to fighting for the rights of his clients who are injured or disabled. Mr. Jacobs has been ranked as an AV attorney by Martindale-Hubbell for the past 25 years. This is the highest possible peer review rating for legal ability and ethical standards. Alan L. Schwalbe was rated as an AV attorney by Martindale – Hubbell in 2015. Mr. Schwalbe has served as a board member, officer and president of the Camden County Bar Association and as a trustee, officer and president of the Camden County Bar Foundation. Mr. Schwalbe has lectured frequently on radio, television and before professional and civic groups on topics relating to workers’ compensation. Robert A. Petruzzelli is a sustaining member of the National Organization of Social Security Claimants' Representatives (NOSSCR) and has been honored by the Camden County Office on Aging for his work as the chairman of the Camden County Bar Association Committee on the Elderly. Lauren Tovinsky focuses her practice on workers’ compensation litigation and Social Security Disability claims. She is a member of the National Organization of Social Security Claimants’ Representatives (NOSSCR). Our entire legal team is dedicated to helping people who are struggling with the consequences of injuries, disabilities and employment problems. All legal services of this law firm are provided on a contingency basis.